There are a few remedies I believe in whole-heartedly: Advil – for headaches, Zinc if you are about to get sick, and Chocolate – for just about everything else. Sleepy? Cranky? Heartbroken? Grab a piece of chocolate and all is well in the world again. Chocolate, although effectual enough to stand on its own, is elevated when it morphs into an enchanting devil’s food cake. Devil’s food cake is the ultimate chocolate cake. Not only is it rich, but its creamy in a way that no ordinary chocolate cake is. There’s a reason they call it devil’s food cake. It is unapologetically decadent. This cake was even more delicious than it looks if that’s event possible. Although, these pictures are pretty sweet!! Preheat oven to 350 degrees. Coat two 9-inch cake pans with non-stick cooking spray. Line with wax paper and coat paper. In a large bowl, beat cake mix, eggs, buttermilk and vegetable oil on low for 30 seconds. Increase speed to medium-high and beat for 2 minutes. Scrape down sides after 1 minute. Fold in 2 cups of the chopped peanut butter cups. Pour batter into pans and bake at 350 degrees for about 30 minutes or until toothpick inserted comes out clean. Cool the cakes completely. Place chopped dark chocolate in a medium bowl. Bring cream just to a boil and then pour over chocolate. Whisk until chocolate melts. Add peanut butter and whisk until smooth. Trim each cake layer so the tops are flat. Place one layer on a cooling rack and pour 1 cup frosting on top. Spread evenly with a spatula. Add second layer and pour remaining frosting over top and sides of cake. Smooth out with spatula. 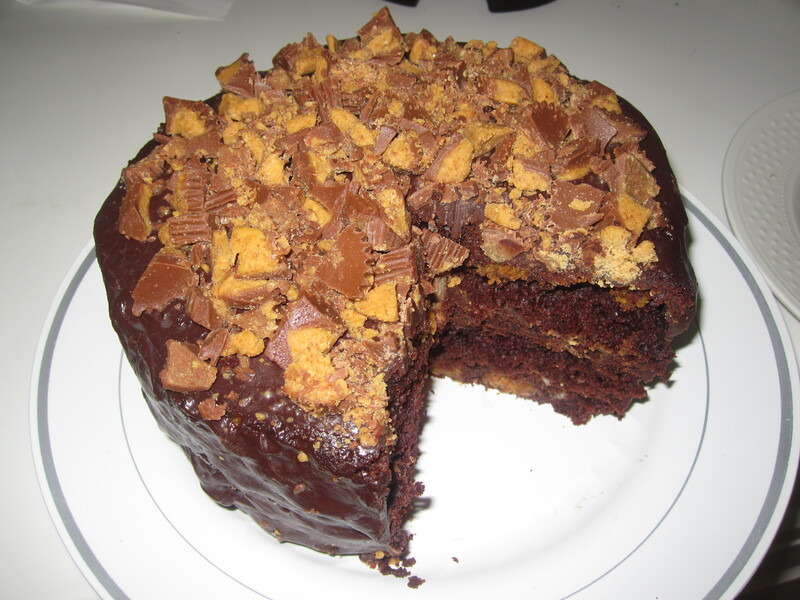 Allow frosting to set for a minute and gently press remaining chopped peanut butter cup pieces all over top of cake. Place in refrigerator for about an hour to set. Remove and serve. 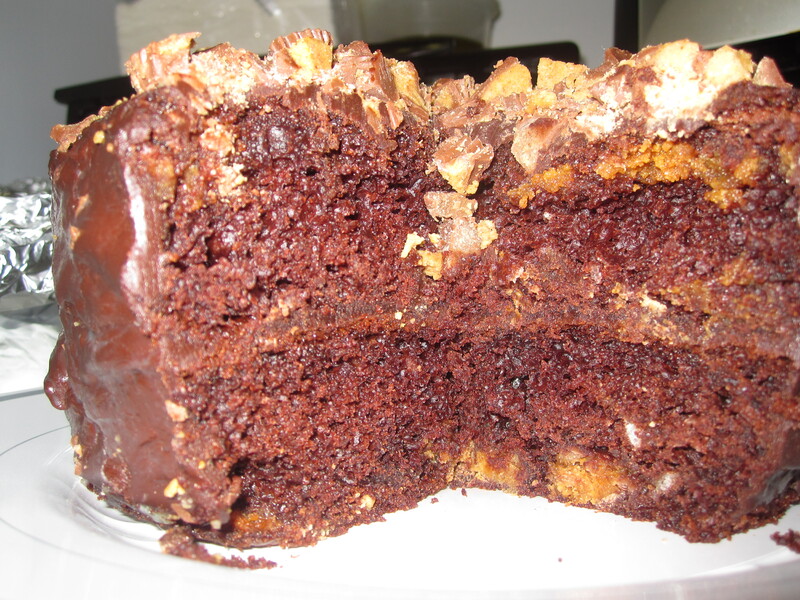 This entry was posted in Recipes and tagged Cake, Chocolate, Dessert, Impressive. Bookmark the permalink.